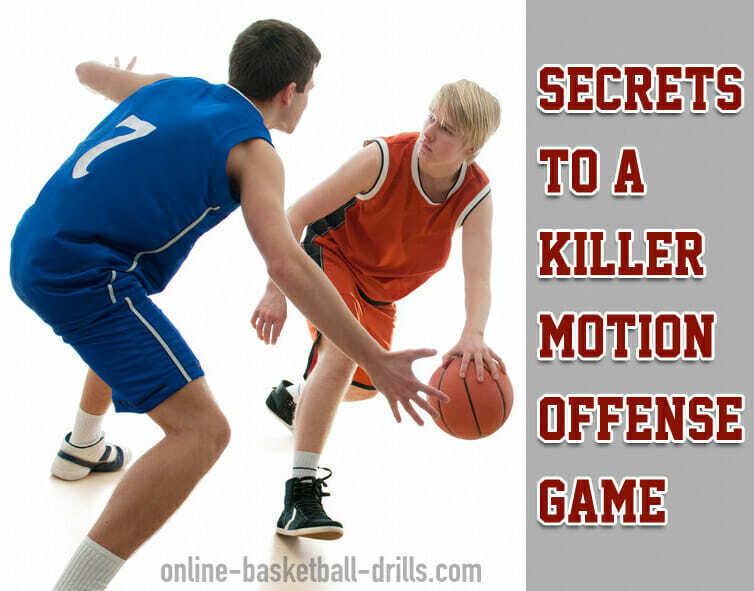 Every coach wants a “killer” motion offense game, right? Well, here are some techniques you can implement into your game to achieve this! These are techniques that I use with my own team. So let’s jump right into it! Here’s what we do. We divide the game into eight different sections. We have our man offense, our inline out-of-bounds plays, our zone offense, our press offense, our sideline out-of-bounds plays, and we have our last-second plays. That’s six of them. And then we have two more that we feel like we have to have. We have a box-in-1 offense and we have a triangle-in-2 offense. We see a lot of teams play box-in-1 against us. 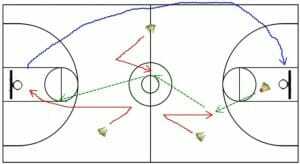 We’ve got about five different plays that we can run for our box-in-1 and our triangle-in-2. The biggest part of our man-to-man offense is our motion. In our motion, we would run motion the old traditional pass, screen away, and all that stuff. And we would throw the ball away a lot. And I’m like, “Why have Zack pass it to Chris here and allow the defense to come in here and steal the pass?” Illinois does it a lot. We started using the dribble hand-offs. And it’s really good for us in that I know that the ball’s going to get to another green shirt instead of allowing the other team to steal the pass. So, we’re coming in for a hand-off. Now, we don’t get many shots out of this. But it really keeps our offense moving. He’s handing it off and his man usually jumps out there and hedges. And then he can pop that and come back and look to get a shot. The second thing we do is a screen roll. It’s a big part of our motion offense. So we’re screening and I call it fake offense. Guys are setting screens and running screen rolls. But they’re not really doing anything. They’re just faking the defense out. And we do a lot of that. The other thing we work hard at is that screen and slip. Player 1 comes at player 2 like he’s setting that ball screen and then he’s going to slip it right to the basket and try to get the lay-up. The third thing we try to get out of this is just a screen and a pop. So you’ll set the ball screen, and then he’s going to pop back. The next thing we work at is our backdoor cuts. On our backdoor cuts, we have three different signals that we use. And I think this is why we get it. If we stick our hand out, that’s one of our signals. If I stick my hand out, I am telling my passer that I’m going backdoor. The second one is the fist. If we put the fist out, we’re going backdoor. And then the third thing is if we hit our leg, we know we’re going backdoor. Now we change that all the time. One week we’ll go, “Stick your hand out.” The next week, fist. So no one really understands when we’re going backdoor and when we’re going to just catch the ball there. And we work hard at that. The fourth thing we’ll do, and we really try to emphasize this in our motion, is what we call screen the passer. 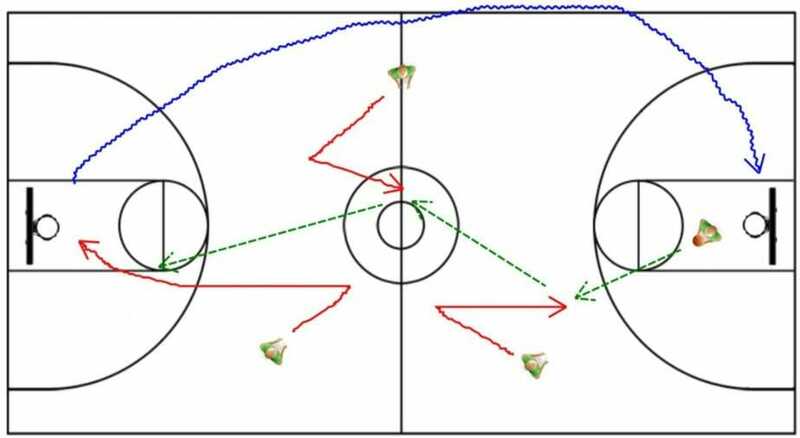 The passer passes the ball to the wing. The wing’s going to come in and screen for the passer. He is going to flare, and the wing is going to pop out to the top here looking for a jump shot. We’ll also do a lot of no dribble stuff in our motion. I think a lot of people do that. It’s nothing really new, but we get to a drill, you can’t dribble. And they hate it. They’re fumbling all over the place, but it makes them screen. The other thing, we’ll try to limit the dribbles. We talk about how you cannot dribble unless you’re improving your angle. And you cannot dribble unless you’re doing a dribble hand-off or a screen roll. 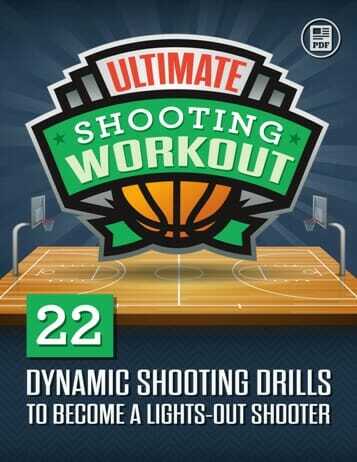 Now I’m going to go through some drills, and our first one’s called v-cut shooting. It’s a full court drill. I like this drill because we get to warm up and we get to run a lot and it’s good for our motion. You don’t have to throw it off the backboard. We’re going to v-cut. We want them to take three steps, and then they’re going to come back and receive the pass. So your player is going to make the lay-up and then run the ball down to the other end. Okay? Pretty simple, but a good drill and it gets them active. At the end of this, we want a lay-up off a bounce pass. So when this guy’s coming and v-cutting, we want to get that lay-up off the bounce pass. Now, what we do, and it’s at times when they don’t have their hands up, we have them clap before they receive the ball. It just keeps them and keeps their hands up. You can drill this by having everyone clap as they come to meet their pass. Now, when we practice, everything we try to do, we try to make it competitive. So we have a green team and a gold team. And we’ll do this drill, we’ll give them one minute and they have to make 12 jump shots in one minute. The guy at the end is going to v-cut and then come in to catch and shoot a jump shot. And in one minute, they have to make 12 baskets. What do you think? Are you ready for a killer motion offense game? Then you’ve got to try these techniques! And then be sure to come back and let us know the results! 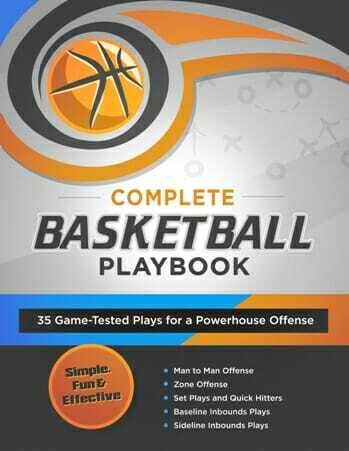 And don’t forget to Follow Me on Twitter, where I will share more free motion offense tips and tricks. 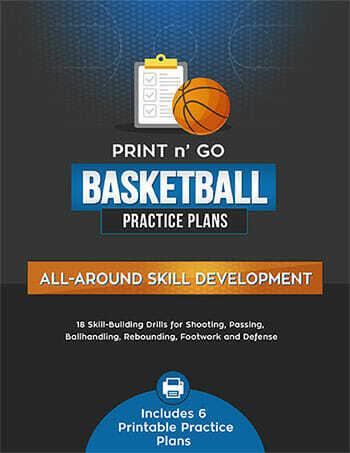 And for more great Basketball Drills and Practice Plans, be sure to check out this link!